Austrian Railways to be Privatized? ÖVP (Austrian People´s Party) again pushes for a privatization of ÖBB (Austrian Railways). 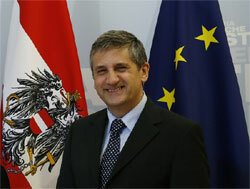 The sale of the freight division would be conceivable, ÖVP´s chairman Michael Spindelegger says. According to Spindelegger, the sale of the freight division RCA (Rail Cargo Austria) or several train tracks will be an issue after the next election in 2013. Spindelegger underlines that ÖBB´s annual subsidies and public guarantees come at € 7.0bn per year. Spindelegger´s coalition partner SPÖ (Austrian Social Democratic Party) rejects that proposal.